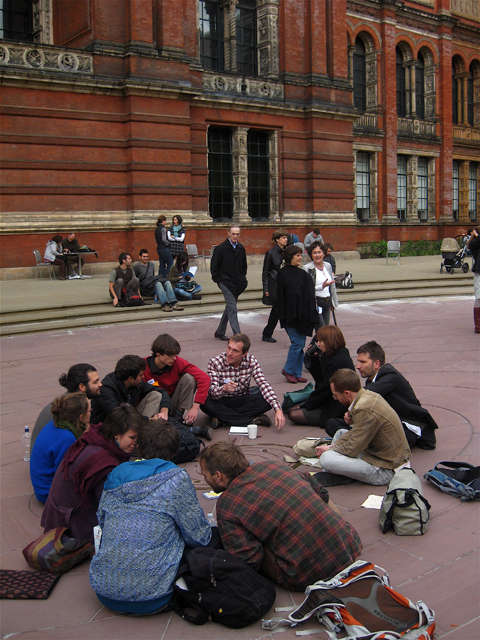 The Teach-In was held last week at the V&A and a packed hall of students, information pills faculty and staff - as well as 22 institutions around the world tuning in to the live Internet broadcast – were there to respond to the critical issues of our time, dosage resource depletion, loss of biodiversity and especially the issue of climate change. 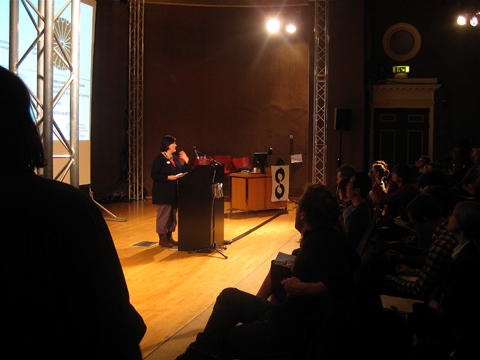 One of the main aims of the event was to focus on the role of the design community in facing these problems. The design community is well placed to offer solutions as well as educate people towards an ecological literacy, an understanding and awareness of how to work towards a sustainable future. One of the main problems addressed is the need to communicate the climate science to people; often dry documents, facts and figures fall short on getting the audience engaged. It is up to designers to try to communicate this and engage the masses. 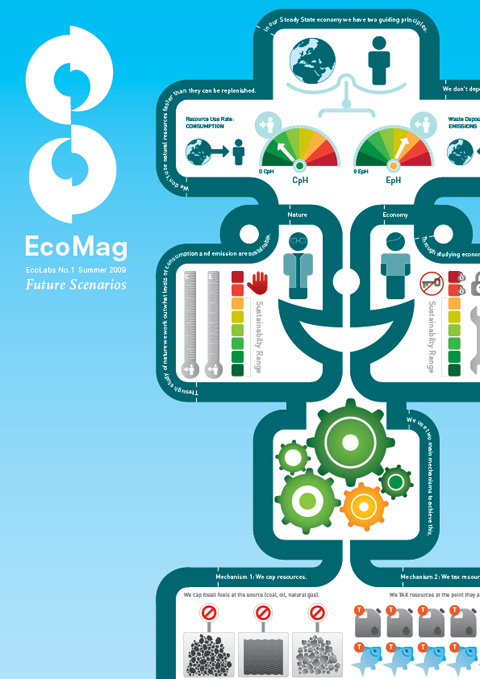 Eco Mag No.1 ‘Future Scenarios’ designed by Eco Labs, a network of designers and visual artists committed to addressing environmental problems, is an example of how this can work. The magazine features an array of artists who respond to the different scenarios we face in a hotter climate, based on Mark Lynas’ book Six Degrees. Amelia’s Magazine is also publishing an Anthology later this year where we have worked with over 20 Illustrators to picture new and sustainable technologies, you can pre order your copy now. Engaging people through imaginative and visual medium is one way we have looked to help to develop an ecological literacy. Science is never going to be a way in for most people and these two methods are great examples of addressing the problem. 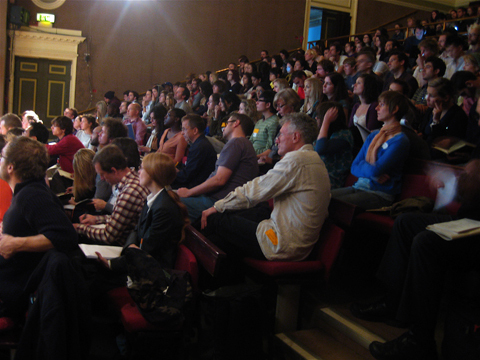 The Teach-In hosted a range of inspiring speakers, Richard Hawkins a researcher at PIRC, that has developed major reports ‘Climate Safety’ and ‘zerocarbonbritain’, opened with a great slideshow illustrating the problems we face. Emma Dewberry talked on Nurturing Ecology in Universities and highlighted some student work like the streetlights that respond to the moons cycle designed by the Civil Twilight collective. The event also gave the audience the chance to get involved with activities and discussions, and it was great to see what ideas we could come up with as a group in such a short space of time. After a quick lunch, speakers from the Tactical Technology Collective gave a talk on their work. They offer guides, tools and training to help groups and organisations increase the impact of their campaigning. Obviously very committed, co-founders Stephanie Hankey and Marek Tuszynski offered an insight of some of the projects they have been working on. 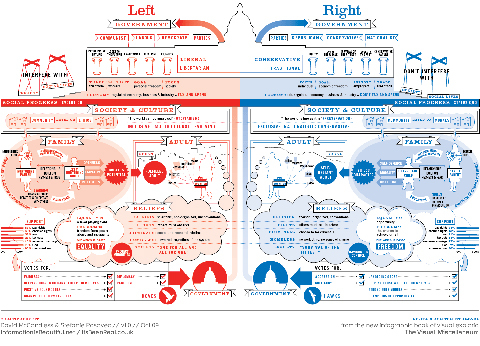 One they told us about that is particaularly worth mentioning is Information is Beautiful, a site that has a range of amazing illustrated charts and diagrams, go check it out, it has kept me engaged for the past half an hour. To end the day John Thackara, director of Door of Perception, gave us a whirlwind tour of his 3-step plan for Universities and the importance of adapting the curriculum to educate about the importance of sustainability. His idea that we should stop making stuff to fix other stuff was also really interesting. He illustrated his point by showing how things like mobile phones and electric or green cars require huge amounts of energy and materials that then render them completely unsustainable. Jody Boehnert, event organiser and also an integral part of Eco Labs, finished with a debate and a quick consensus decision making on the 2012 imperative, which can be viewed here. It sets the aims and points out what individuals and the educational institutions can do to tackle climate change. People left discussing how to implement some of the ideas developed by the Teach-In, in particular, how Universities and workplaces can work towards some of the aims. The day inspired another group of people that will hopefully continue to implement the imperative and spread the word in any exciting visual and imaginative ways they can think of! 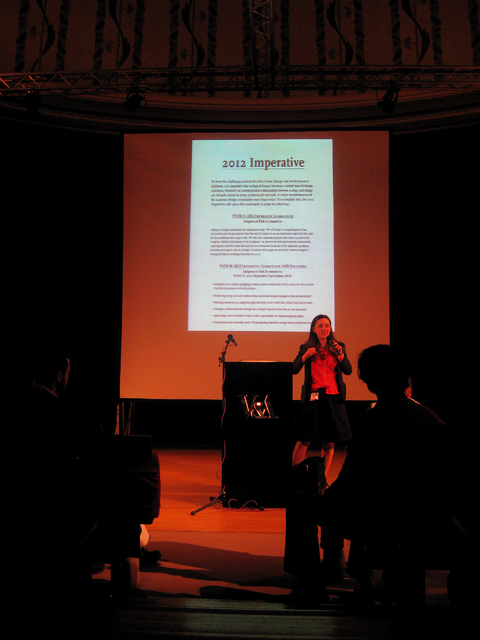 Make sure you join the movement and visit the website and sign up to the 2012 Imperative. The Jerwood Drawing Prize is back again for another year and 2009’s hopefuls won’t disappoint. The longest running annual exhibition has been going since 1994 and is dedicated to promoting and rewarding excellence in contemporary drawing in the United Kingdom. Spaced over two rooms, sickness the first piece I come to is by artist Kate Russo, whose two works sit on top of one another. The first, “Dissolving Symmetrically” and the second, “The Key Is Repetition”. Both pieces are done on graph paper, working in the confines of grids. Amongst the mass of verticals and horizontals, Russo has rendered an extremely intricate network of minute coloured squares. Using coloured pencil and graphite she has systematically filled in alternate boxes to eventually build up a repeat pattern that you can only distinguish from a distance. It is clear that time and dedication has been taken to carry through this task she has given herself. It is interesting because the outcome of this drawing was predetermined by the system she chose to follow to colour in the squares. As I look closer the tiny dots almost look as if they’re vibrating, bouncing off one another like molecules in an atom. Or perhaps they even appear to be working ants, busying themselves around a nest. 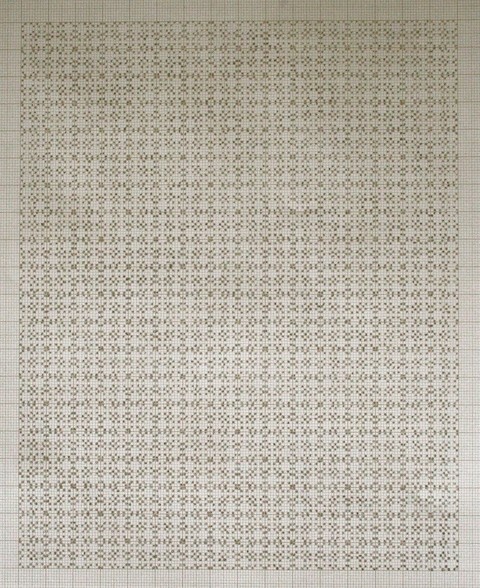 This is quite a satisfying piece of art to study, especially if you have a thing for mathematics, rules or systems. The work of Catherine Nicholson is quite arresting as my gaze moves over to the next piece. “After The Storm” is in pen and ink on a large canvas. It is the most intrinsically rendered drawing of a collection of apparently decomposing branches, leaves and foliage. On closer inspection you see that Nicholson must have used an extremely fine nibbed pen to achieve the level detail, from the veins of the fern leaves, the cracking of the bark on the branches to the areas where the leaves are starting to decompose. At first this may appear to be a very well executed study of nature but the title makes it take on a new meaning. “After The Storm” makes you think that these are the debris of a natural disaster maybe. Where they all once growing peacefully somewhere in an undisturbed habitat? Perhaps now ripped from their surroundings and discarded in the dirt by the storm. Another two drawings by Japanese artist, Yumi Shimada are displayed to my far left. 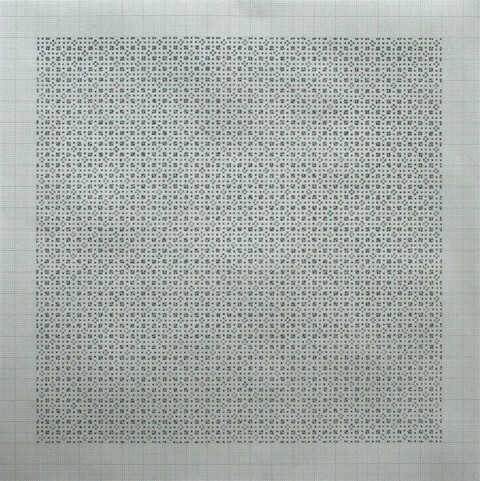 One sitting on top of the other, “Self Portrait 2008” is drawn in black ink on paper, showing an unknown formless being in the centre of each frame. The undeterminable origin of this creature, no visible facial features and its forthright position on the page is quite confrontational. 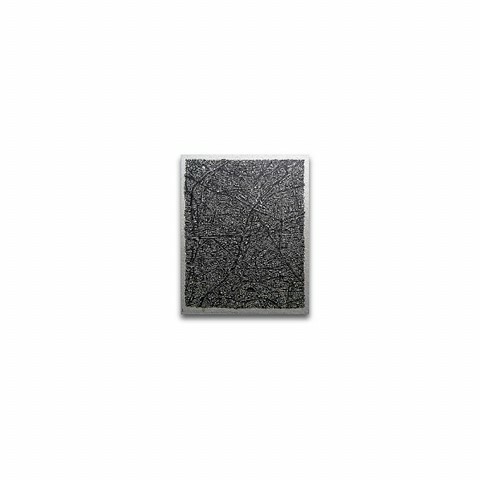 The surface is made up of dark, black cross-hatching to give a sense of a thick, dense mass. The first drawing shows it slumped over the length of a small table, almost as if it can longer take it’s own weight. The second is far more disturbing, depicting the creature sending itself through a mangle and turning itself into a black, viscous liquid on the other side. The scene described is actually quite disturbing. It appears that it is performing this act of it’s own will. I am brought to mind the ‘stink-spirit’ character, Okusare, in Spirited Away – a sloth-like, sluggish being. I try to work out the connection between the two pictures. There is perhaps a sense of despair in the first, which may consequently lead to the macabre finality of the second. Shimada says that the portrait shows her squeezing negative thoughts through the mangle, somehow disposing of them. The world that this creature inhabits is not one I recognise. The influence from Japan and the Japanese fantasy genre is apparent. The ominous nature of it and connotations of the dark under-belly of somebody else’s imagination does not make for particularly comfortable viewing. At the same time, I have conflicting feelings that it is strangely compelling. A morbid curiosity to look at something you know will scare you. The final artwork that I come to is also my favourite. The most reserved of all the pieces on show in size and yet the most monumental in its stature, Samuel Kelly’s “Tokyo Aero-abstraction 7” is quite awe-inspiring. If I had thought the previous drawings had a good eye for detail, it doesn’t compare to this. Drawn on a tiny square of paper, dimensions probably no more than 4cmx5cm, it appears to show an aerial view of a city or road system. Even standing at a normal distance away, it just looks like a grey block of colour. You are invited to stand much, much closer – my face is literally inches from it. Only then can you really see a tiny network of roads and buildings and appreciate its complexity. It is so tiny in fact, that I can only imagine that Kelly would not have been able to draw this with a pencil nib any finer than the point of a pin. I have to say, without delving any deeper into its underlying meaning, it is easily impressive enough as it is. The modest frame seems mammoth in comparison. It allows it so much space, emphasizing even more it’s miniscule proportions. There is something quite impressive about creating work on a microscopic level, like the artist who makes objects to fit on the head of a needle. There are many more notable examples of drawing on display today, even in a relatively small gallery space; you could spend hours soaking in the extraordinary talent showcased. This is the last week of the exhibition’s run, so head over soon to avoid disappointment.